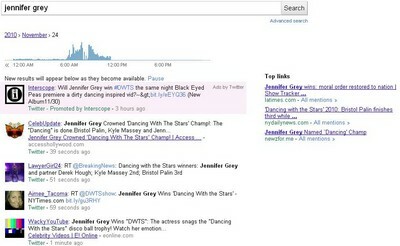 Google begun displaying Twitter’s Promoted Tweets in its real-time search. This is the first time ever, the internet search giant has started displaying ads from another network in its listings. Google made an instant change which will be widely noticed in the US while the UK viewers would be able to administer the change as Twitter launches its advertising platform next year. Twitter’s Promoted Tweets allow brands to insert ads in Twitter search results, while a fee is charged to display them. Promoted Tweets are quite similar to Google AdWords, which are displayed at the top of a search page with a ‘promoted’ label. Earlier, Google started displaying Tweets in Google searches. And now, Tweets get a top up as Google starts displaying real-time updates in form of ‘Promoted Tweets’ in the US, where ads from brands such Verizon, AT&T would be displayed in a shaded box labelled ‘Ads by Twitter’. The recent deal between Google and Twitter would result to revenue-sharing generated from Promoted Tweets. Nick Jones, Managing Director iSpy Marketing termed the deal as a ‘breakthrough’ for Twitter. Almost 30 Advertisers have signed up with Twitter to create Promoted Tweets that appear in Twitter searches. The micro blogging site is also in talks with several brands in the UK including Sky, Sony and Vodafone to become one of the first companies on the ad platform when it launches in the UK.